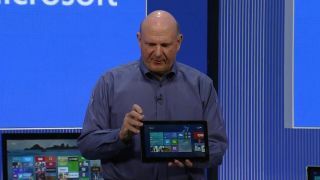 Microsoft may be testing out the Surface 2 tablet right now and leaving behind a trail of evidence. The device name "Microsoft Corporation Surface 2" has regularly popped up on the device logs among other Windows-run hardware, according to ad firm AdDuplex. "Microsoft Corporation Surface with Windows 8.1 Pro" is a second mystery device listed among the 10,000 different model names AdDuplex sees in a single day. "The [Surface 2 listing] definitely looks like a new device," suggested the ad firm, which based its data on the 393 Windows Store apps running its AdDuplex software. "But the second one theoretically could be just a change in what Surface Pro with Windows 8.1 installed reports." AdDuplex went on to speculate that the preview version of W8.1 didn't change the device name, so it's either a later build like the Windows 8.1 RTM or a new version of Surface Pro altogether. Even though Nokia doesn't have a Windows tablet on the market, the Finnish company has strongly hinted that it is working on such a device. The logs could back up this years-in-the-making promise, with Nokia device sightings happening as early as October of last year, according to the ad firm. "The device was named RX-107. Then we've seen RX-108. And then RX-113, 114, 115, 116. Interestingly enough we haven't seen RX-109 through RX-112." "It's hard to say if all of these are just variations of one device progressing through development stages, or 2 device lines (107-108 and 113-116) or something else." We should get further clarification next month, as Nokia is rumored to finally unveil its first Windows tablet in New York City on Sept. 26. One of those could point to the rumored 10-.1-inch Nokia Sirius running Windows RT.